Welcome to the seventh video of the Rhythm Guitar Quick-Start Series. In this lesson, we’re going to put the bar chords you’ve learned to use by playing through some of the common chord progressions that you’ll see as a rhythm guitarist. 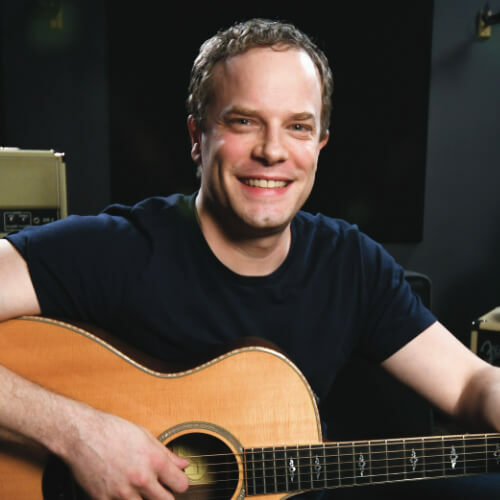 Being able to use your bar chords to play through the more common chord progressions will be really useful when you are jamming with your friends, learning a song you don’t really know, or playing a church gig. I won’t go too far into the theory of this yet, but I want to make sure you have some basics down first. For this video, we’re going to be in the key of G, which means the G note is our tonic, home base, or root note. We’ll cover three basic chord progressions. The first is the 1 4 5 (or I-IV-V), the second is the 1 5 6 4 (or I-V-vi-IV), and the third is the 2 5 1 (ii-V-I). These numbers refer to the chords in a certain key, so be aware that every major key has seven chords you can choose from that occur naturally in that key. Those chords are represented by the numbers one through seven. We’re going to use the four bar chords you’ve learned in the previous lessons to play though these chord progressions. It may seem difficult at first, but stick with me through the video and by the end it will start to make more sense to you. Closer to the end of the lesson, you’ll see that moving your bar chords around through chord progressions is quite valuable since you’ll be able to play in any key you want. This is one of the most powerful concepts you can learn as a rhythm guitarist, so don’t feel pressured to get all of this down the first time through. You can come back and work through this lesson as many times as you need to. The first chord progression we’ll learn is the 1 4 5, and we’ve actually already done this in the Rhythm Guitar Quick-Start Series by working on our G-C-D chord progression. Just know that this is a 1 4 5 chord progression, and when you’re in a major key, the 1 4 5 chords will all be major chords. We start with the 1 chord, and because we’re in the key of G, we will start with a sixth string E shape G major bar chord. The 4 chord is a C chord, so instead of jumping around the fretboard, just move over to the A shape bar chord with the third fret of the fifth string giving the C root note. 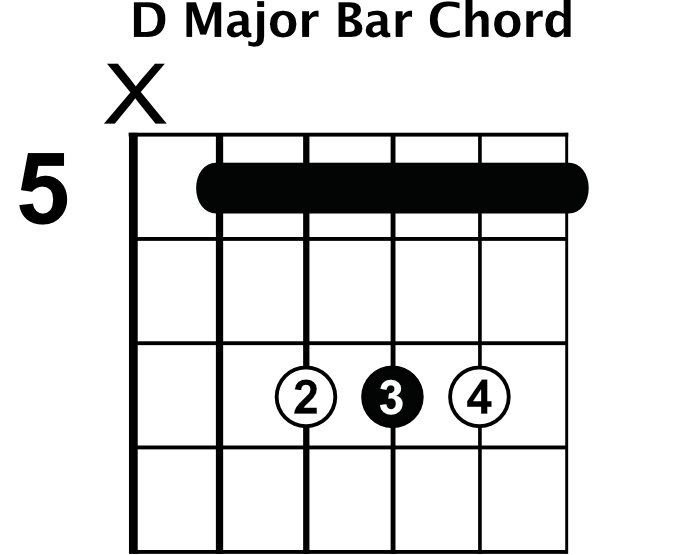 Our 5 chord is a D, so we’ll need to move our bar up to the fifth fret of the A string. Play through the G-C-D progression until you get those changes down. It may take you a while to get it sounding smooth, but that’s okay. You also want to listen to this chord progression and memorize what it sounds like too. The next chord progression we’ll work on is the 1 5 6 4, which is a really popular chord progression you can hear in all types of music. You’ll notice that we’re using three of the chords from the last lesson, but the order is different this time around. We start on the 1 chord again, making a G chord with our E bar chord shape, but instead of moving to the 4, we’ll go right to the 5. We’ll make a D bar chord using the fifth string shape on the fifth fret. For the 6 chord, we’ll move to the E note on the seventh fret of the fifth string and make an E minor bar chord. 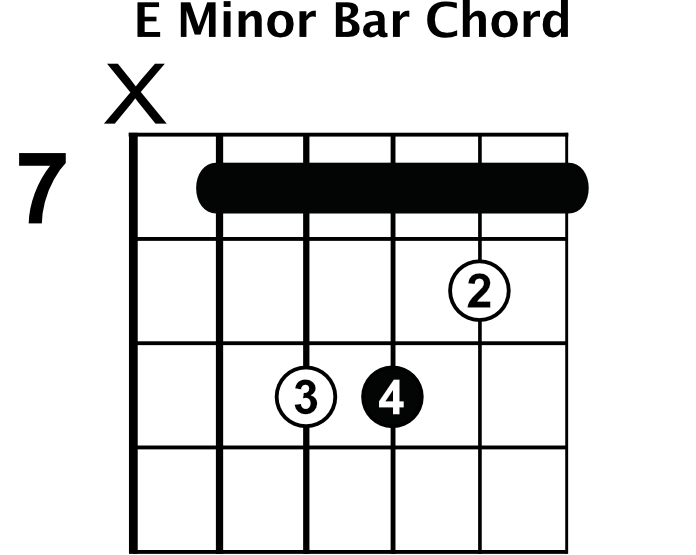 It’s good to note here that the 6 chord in a major key will always be minor. Next is the 4 chord, and that will be our C bar chord using the A shape. Go through this chord progression as much as you need to get the flow down. It may not sound great at first, but you’ll get to know exactly where to go for this chord progression. Listen to the sound of this progression too, memorizing the sound you hear. The last chord progression we’ll go over is the 2 5 1, and while this progression is most commonly known for jazz music, it is used in all kinds of music. I’m sure you’ve noticed this is the only chord progression we’re going over that doesn’t start on the 1 chord, but starts on the 2 chord instead. In a major key the 2 chord is always a minor chord, and since we’re playing in the key of G now, we need to make an A minor chord. We’ll use our E minor bar chord shape on the fifth fret of the sixth string for the A root note to make our 2 chord. 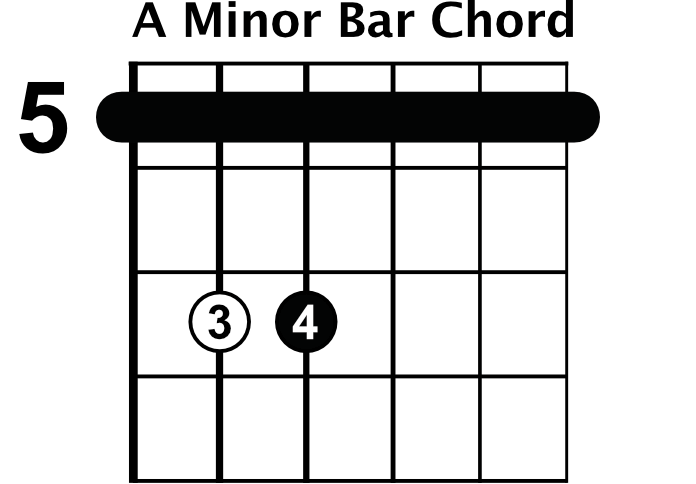 The next chord is a 5, which in the key of G is a D. For the D major bar chord, you can keep your bar on the fifth fret and just move to an A major bar chord shape. For the 1 chord, you’ll go back to your G major bar chord on the third fret. Spend some time working on the movement of those chords, getting the transitions down, and listening to how this chord progression sounds compared to the others. 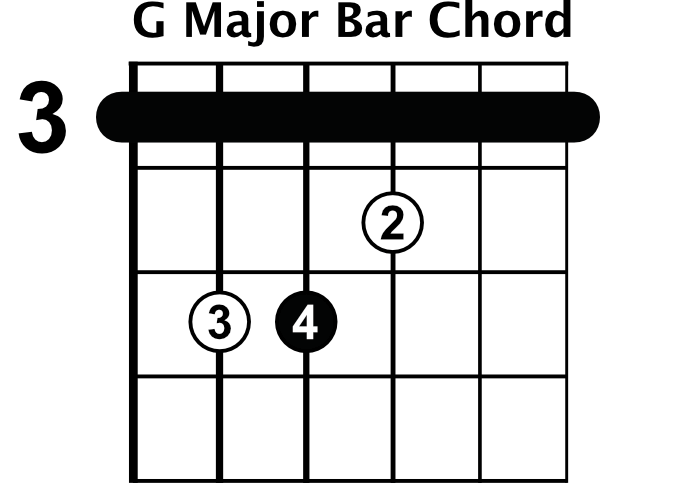 That wraps up the three essential chord progressions for this lesson, so now comes the real magic of bar chords. You already know bar chords are movable, but what’s great about using bar chords in progression is that the progressions are now movable too. I can play a 1 4 5 in the key of G using the G root note on the third fret, but if I want to play that same progression in the key of A all I have to do is move the home base or root note by playing an A major bar chord on the fifth fret. If I now play those same bar chord shapes relative to where I start, I’ll be playing a 1 4 5 in the key of A major. I didn’t even have to think about it because all I had to do was memorize this shape and shifting pattern relative to where I started. You can do this in any key you want. If you wanted to play a 1 4 5 in the key of C, all you have to do is change your starting point to a C by playing a C bar chord shape on the eighth fret. This is helpful when you want to jam with your friends but you don’t know the song very well or you have to read a chord chart. I’ve made a new jam track for you to practice your progressions and moving them around. It’s similar to the track you’ve already been using, but the bass and piano have been taken out so you can play any progression you want. This track is like a glorified metronome. It’s more fun to play with a drum track than just a clicking metronome. I’ll play through all three progressions in the video so you have an idea of what you can do. I know this was a lot of information to learn in one lesson, but focus on getting these progressions down with these bar chord shapes, and then moving them around to new keys. If you need to reference the E and A string note names as you go, that’s okay. In the next lesson, we’ll switch gears and make sure you know the most essential open chords you’ll be using as a rhythm guitarist. See you in the next lesson: how to play open chords.